Stephen Ritz is a school teacher and administrator in one of America’s toughest and poorest districts – New York’s South Bronx. He teaches science, and his home base is one of the most troubled schools within the Bronx itself – Public School 55. But while most teachers might be content going through the daily routine of teaching, marking exams and perhaps organizing some extracurricular activities, Ritz has gone the extra mile. And a very long mile it has been. The Bronx has more crime, more poverty, more gangs and more school dropouts than most American neighbourhoods. It has more concrete than parkland, more soup kitchens and food banks than decent grocery stores and good restaurants, and it has more public housing than upscale condos. Half its residents live below the poverty line and a full one-third are affected by food insecurity. Of the 62 counties that make up New York State, the Bronx has been singled out as possibly having the worst quality of life and health care. And despite the best efforts of the education system, school attendance is notoriously low and graduation rates even lower. Many of its students live in poverty; many come from broken and single-parent homes and too many arrive at school hungry and go home hungry. It’s a vicious circle that all but guarantees failure. 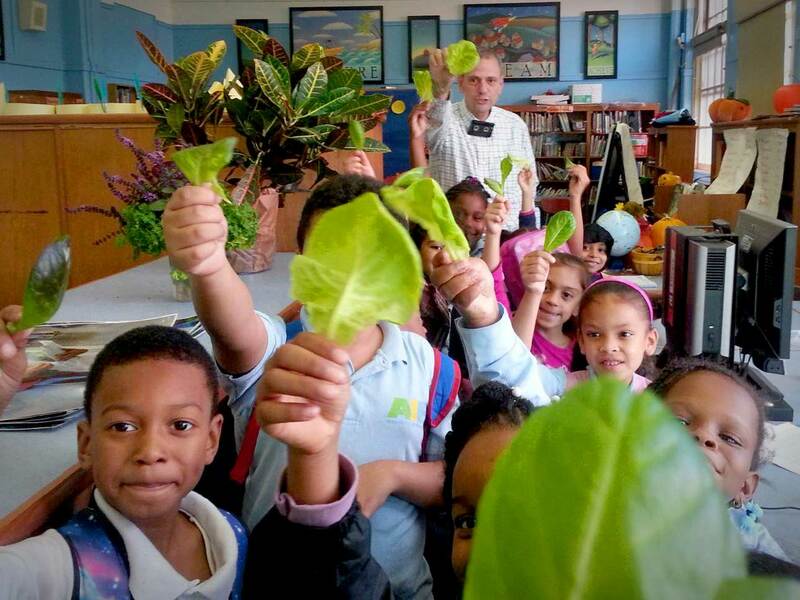 But the Bronx also has Stephen Ritz, the award-winning teacher and his Green Bronx Machine. The GBM is a non-profit organization that over the years has transformed the lives of thousands of these students – from kindergarten to high school – by teaching them how to not only grow their own healthy food, but to expand the idea into a nationwide phenomenon. The story began, quite by accident, about 12 years ago, when Ritz – who jokingly refers to himself as “the world’s oldest sixth grader” – received a gift of a box of daffodil bulbs. Not knowing exactly what to do with them, he stuck the bulbs behind a school radiator, and forgot about them. Until one day, a short while later and again quite by accident, he noticed that some of the bulbs had actually blossomed into flowers. The heat and steam from that radiator had done their magic, and so was born the germ of an idea that would grow into an unstoppable mission. Ritz had what in hindsight can only be seen as a moment of mind-numbing clarity. At the very heart of the problems that had been festering in the Bronx, and in particular with its school-age youth, lay three inseparable issues – poor nutrition, poor health and failure in school – and unless the issue with poor nutrition was fixed, nothing would change. And so began what would become one of his many projects that would forever turn around the lives of thousands of the Bronx’s inner-city kids – the “Edible Wall.” Funded by Ritz himself, he put together a makeshift wall in his science classroom and planted fruits and vegetables in some equally-makeshift planters. And it was an instant success. He encouraged his students to plant seeds and seedlings and to look after their indoor “farm.” The students devoured the idea and the opportunity. They took possession of the project and treated the plants as their own personal achievements and success stories, to the point where Ritz’s classroom attendance very quickly went from 40 percent to over 90 percent. And instead of going home to warmed-up pizza and chips, hundreds of the school’s students were eating healthy food, some of them for the first time in their lives. “When kids are hungry in my class, they can get up and go eat off a wall,” he said. But that was just the beginning. What started out as an experiment soon turned into a Bronx-wide, and eventually a nationwide, project. Empty and abandoned land was repurposed, other schools handed over unused rooms and the local government and private corporations even helped out. In a donated 1,500 sq. ft. facility, and with the help of crowdfunding that he organized, Ritz set up what he calls the National Health and Wellness Center, where, according to the GBM’s website, “students and teachers can grow their way and work towards a brighter future.” The indoor facility has a “teaching farm” where the students get hands-on experience growing food. A “teaching kitchen” gives them instruction on how to prepare healthy meals, and enough food is grown to supply 100 of the school’s students with weekly bags of fresh vegetables. Ritz’s indoor farm idea was then expanded into other local schools, including the installation of a year-round hydroponic garden and culinary program in the JVL Wildcat Academy, where the school is now turning out future chefs. You can check out a video of JVL’s operation here. And more projects followed – too many to cover in one article – like the Bissel Gardens project, and the Hyde Leadership Charter School project, which resulted in the students being invited to the White House to meet chef William Yosses. Today, tens of thousands of pounds of food later, Stephen Ritz’s Green Bronx Machine is still going strong. He and his students have created more than 100 school farms around New York, and they regularly donate much of the food to local food banks. School attendance and grades are way up, more than 2,000 former students have been trained and found employment designing and building roof gardens, and the South Bronx is just a little better off. To get a better insight into Stephen Ritz’s mission, you can take a look at a 2012 TED talk that he gave here. Some of the students at the JVL Wildcat Academy school in the Bronx. Stephen Ritz with some of his younger students. All the vegetables that are produced by the students can be used in school lunches, taken home or donated.